Missing out on Phish in Alpharetta this weekend? Well, have no fear. Stock the fridge and ready the snacks—Couch Report is here to help you get to the moment when the lights go down. You can also win an LP of Rift, signed by Tom Marshall! In the agonizing hour waiting for the band to take the stage for their Saturday-night special, join RJ, Matt and Jonathan of Helping Friendly Podcast for the free webcast Couch Report. The guys will get down to the nitty gritty, breaking down tour so far, taking questions, making predictions and more. If you’re watching the LivePhish webcast, we’ll be here for you before the show, at set break and after the show. Send us your show photos, Couch Tour photos and your questions via Facebook and Twitter, or live during the broadcast in YouTube chat. To enter to win the signed Tom Marshall Rift LP, share a haiku about a show on this tour to Facebook or Twitter. 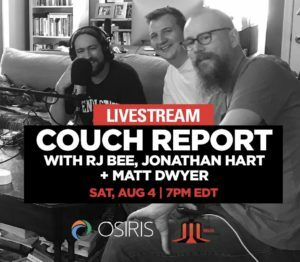 Use the #CouchReport hashtag!